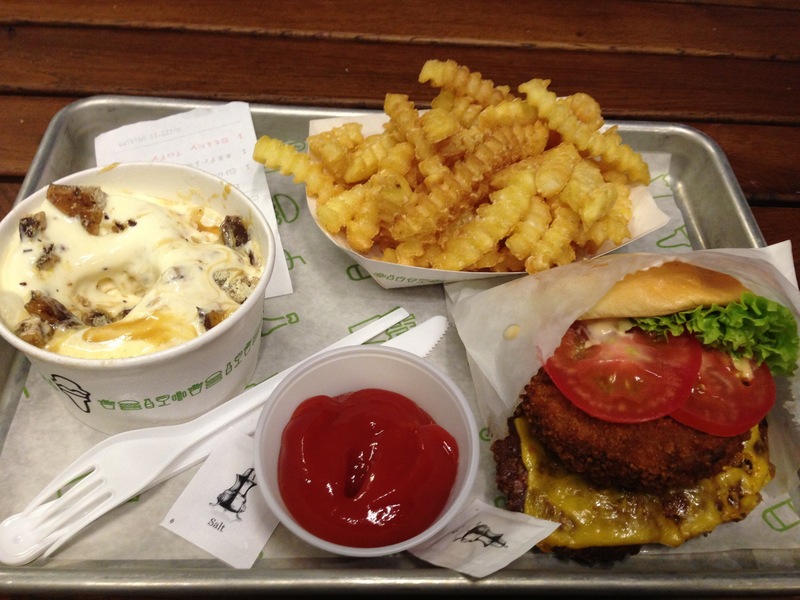 Home » ★★★☆☆ » Shake Shack. It didn’t change my life. Shake Shack. It didn’t change my life. Reader, I’ve tried it. Hallelujah. It’s taken me long enough. I’d got my inbox down to zero and was feeling very pleased with myself, in a sad sack, OCD way. It was 8.30pm and I’d been good on low carb for almost two long days and life was looking sweet, if not slim. So obviously I needed to ruin the good work and commit carbicide. You understand. London readers: unless you have been on another planet, you’ll have heard of this burger joint in Covent Garden. Imported from New York, the hype surrounding it has been something to behold. I had to try it. It’s the latest in the new wave burger joints. I got there at about 9.15 and was told that the queue might be half an hour. Half an hour? At that time? Normally I’d have walked off before the words even left the mouth, but I was committed, having walked 45 minutes to get there, in a sorry attempt to counteract the damage I knew I was going to inflict. You get a menu whilst you queue, so there’s plenty of time to choose. And there are burgers, hot dogs, shakes, concretes and fries. Encouraged by the enthusiasm of food blogger Samphire and Salsify and because I can be very suggestible, I tried the Shack Stack. At £7.75 the most expensive burger on the menu. Obviously. This is the combination of Cheeseburger, a Shroom burger, lettuce tomato and ShackSauce. The Shroom burger is a crispy fried portobello mushroom filled with melted cheese. It worked well together with the beef patty, the meat was good and served medium-rare despite the best efforts of Westminster and the fried mushroom was crispy and gooey inside, but the Shack Sauce wasn’t particularly noticeable, so I couldn’t really tell you what it tasted like. Which is a shame. I had to add ketchup. The crinkle cut fries were fine. I’d have liked some Sarsons. I’m from the North. The concrete was the thing that had caught my eye from the menu. Dense frozen custard ice cream, blended at high speed, with mix-ins. I chose the Sticky Toffee. Chocolate toffee, Paul A Young chocolate chunks, salted caramel sauce and malt powder. In truth, less than the sum of its attractive-sounding parts. 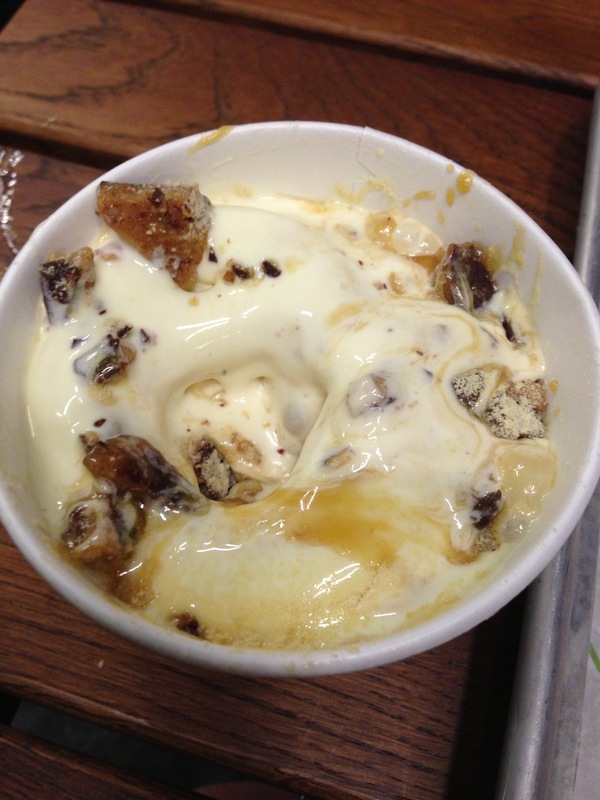 Ice cream with nice bits in it. That is all. By the time I’d finished the burger, the thing had melted to the point where I didn’t feel obliged to finish it. More liquid than concrete. I’m very glad I’ve been. I did my blogger duty. It was tasty. It was a burger. It didn’t set my world on fire. It’s very American in feel, despite the nod to voguish British ingredients and suppliers. I’d never queue for it again. I didn’t think it was anywhere near as good as MeatLiquor or Patty & Bun and I think, like Covent Garden, it’s mainly for the tourists. It’s not bad at all: it’s just home from home for the American tourists who made up a large part of the ridiculous queue and a temporary excitement for those of us who fell for the hysterical hypefest. Like me. And no, I won’t be the shmo that goes to Five Guys either. There’s a limit.